Narrated Abu Huraira that Prophet Muhammad said: On the Day of Resurrection, Ibrahim will see his father Azar (in such a pitiable condition) that his face will be dark and covered with dust. Then Ibrahim will remind him: Did I not warn you against denying me? His father will reply: Today I will not deny you. Then, Ibrahim will say: O Lord! You have promised not to disgraceful to me on the DAy of Resurrection. So what will be more disgraceful to me than my wretched father. Allah will say: I have forbidden Paradise for disbelievers. Then it will be said: O Ibrahim, Look! what is underneath you feet? He will look and see his father as Hyena - besmeared with dirt caught by the legs and thrown into Hell. Note: Due to infidelity, Azar will not be forgiven in spite of his son Ibrahim`s intersession for him and he will be transformed into an animal and cast into Hell. It also proves that the pagans whoever they are by kinship, will be forbidden from entering Paradise for ever. They will remain in Hell and suffer the agonies of torment which they had been frightened of by the Messenger of Allah at different times. Narrated Anas bin Malik on the authority of the Prophet , so said: Allah will say to the least tormented person among the people of Hell on the Day of Resurrection: Do you have anything on earth, that you would give as a ransom (to protect yourself against the torment of Fire)? He will say: Yes. Then Allah will say: While you were in the backbone of Adam, I had demanded you much less than that, ie. 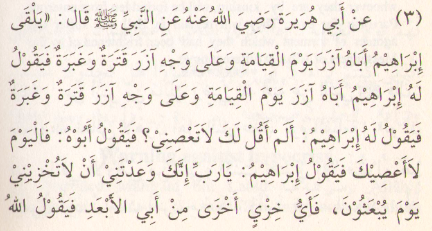 to associate nothing with Me; but you declined and worshiped others besides Me.